Too often I read blog articles touting side hustles to help stay at home moms make money, but just as often they require waaayyyy more time than promised, require quite a bit of money up front, or are otherwise unrealistic for most cash strapped moms. 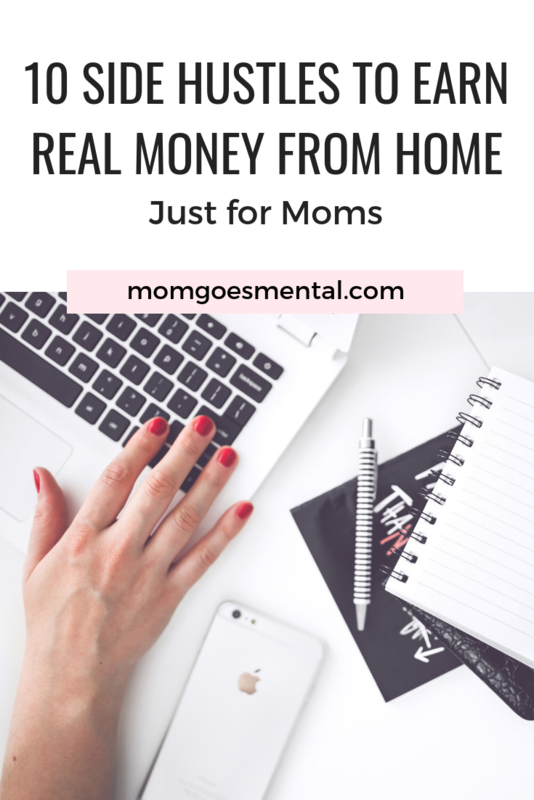 Before going back to work full-time, I spent years working at home with two little ones in tow and chugging away at my side hustles so that we could afford for me to stay at home with the kids. All of these side hustles are ones that I have personally done and made fair, decent, and even amazing money doing– no MLM signups or selling of my soul required! This one is probably the biggest investment when it comes to time, so I wanted to go ahead and list it first. It’s not that you’ll spend 60 hours a week building your blog. Rather, starting a blog can take weeks or even months to get really rolling. However, once traffic is consistently coming in, so will those side hustle dollars. I recommend starting right away and using this super comprehensive article (love!!) to help you. Virtual assistants are in high demand because they are so valuable. Earning between $15 and $25+ an hour, virtual assistants help businesses with a myriad of tasks, such as product research, answering phone calls, responding to customer service emails, organizing projects online, and much more. Think of them as the handymen of the online world. If you’re an online jack of all trades, set yourself up a website, list the services you have the expertise to provide, and start pitching to small business owners. This article is a great place to start learning more about becoming a virtual assistant. Starting a business can seem as daunting as blogging for money, if not more, but it can be extremely lucrative. The trick to starting a successful online business is to find a unique niche or solve a problem. Then, establish a brand identity that connects your company’s story to your customers. Branding becomes the glue that holds your company’s message together and entices customer’s to become loyal followers. Check out The Story Exchange’s vast list of tools and resources for more help starting your own business. Running a blog or owning a business doesn’t necessarily mean your grammar is perfect, and many people want a second pair of eyes to look over their posts before publication. Even more, some will pay you to completely create their content. The best way to start snagging writing and editing jobs is to set up a portfolio. I’d recommend creating your own WordPress website showcasing your services and writing skills, as well as documenting any articles you’ve had published elsewhere. Offer to guest post on a few blogs for free, then start sending pitch emails to small businesses with blogs or growing niche blogs where a second pair of eyes (or hands) might be beneficial. As the importance of visual media grows, so too does the stock photography industry. Tons of small businesses and bloggers alike, myself included, use stock photography to create a cohesive and professional visual aesthetic. If you’re one with an eye for a killer layout and you’ve got a decent camera (I’ve heard even an iPhone can work) and a few props, there’s a good chance you can put together some pretty gorgeous stock photos. The key here is to create collections for sale so bloggers and businesses can purchase photos by the bundle and know they’ll all follow the same theme. Make sure you’re also ready to give some away for free in exchange for joining your email list where you can advertise your paid collections further. Are you an expert in something? Then teach it to people online! Whether your particular skill is as superficial as how to start a WordPress blog or as extensive as learning a new language, there’s a place for you. While I’m no expert on online course creation, I do highly recommend checking out Kimra Luna’s Freedom Hacker courses. She offers both free downloads and paid courses you can enroll in. Marketers are often extremely busy in the age of ecommerce. Their clients need to be kept up to date on what’s been done lately, influencers they work with must be nurtured, the work itself needs to be completed, and they need to continue pitching to new businesses to keep their income stream alive. It’s exhausting! Try using Instagram to find successful marketers who are thriving and send them an email asking what type of help they need. Make sure to sound professional, include your services, and offer to pass along any references or testimonials. Make sure you mention how your social media, product, advertising, or business expertise can specifically help them. If you’re a mom like me, you’ve got boxes and boxes of things you don’t need anymore that just don’t have a good home. For example, a few local organizations where I live will take new toys but not gently used ones. I also have great shoes for kids, but both local consignment stores are all stocked up. Put your phone to good use and start listing your kids’ old clothes, shoes, books, and toys on an Instagram account used just like a thrift store. Utilize Instagram’s multi-picture option to fully showcase each item, and send invoices via Square or PayPal. Quick tip: network with mom bloggers to help raise awareness and grow your Insta-Thrift Shop! Try offering a free book or toy to these mommy influencers in exchange for a shout out to their followers. Loop giveaways have become a wonderful way to grow your followers on Instagram, and if you follow me you’ve probably joined in on one. With costs ranging from $30-$500+, these promotions have the potential to make their organizers a nice profit. The down side is that competition has become fierce and many giveaway organizers are hiring promoters to help reach more bloggers and shops on Instagram. If you’re a natural salesman, becoming a promoter for a loop giveaway may be the side hustle for you. To find one that’s hiring, search for “loop” on the Instagram app, and scroll through their feed for any “We’re hiring” graphics. Do you have a knack for spotting thrift store trash and turning it into treasure? If your weekends are spent pinning your next DIY project or reupholstering an old chair, flipping furniture might make you a tidy profit. This side hustle involves making small investments in run down furniture and supplies, then restoring it to its former glory or turning it into something brand new! You can even drive through most neighborhoods on a Saturday morning and find free furniture on the curb just waiting for the right person with an eye for potential. Etsy, Craigslist, and Facebook Maketplace are all good avenues to resell it once you’ve given a piece new life, but don’t discount antique stores, either. Many give you the option of renting a booth for a small fee and taking advantage of their foot traffic. Blogging definitely is popular now, lots are earning huge figures. Love the idea of the Instagram thrift store! creating stock photography is a really good one, that i probably would’ve never thought about. Lots of great ideas! Thank you for the information! I love the instagram thrift store idea. I follow several shops like that and the photos make me want to shop! The virtual assistant sounds like something I could do, I am already doing something like this in a volunteer capacity. Thanks for an informative article. Some great ideas. I love to write, but don’t have the want to keep up with a blog. Loop promoter sounds interesting. I’ll have to search to see what I can find. Thanks! These are some great ideas! Perfect for spare money during the holidays. Starting a business is a good one! Awesome ideas in this article! Interesting ideas. I’ve never heard of a virtual assistant. I love the Instagram thrift store idea! I have sold a few items here and there on eBay, so I’m familiar with shipping and things involved already. Thanks- I did not know of some of these options. Wow you have some great tips. I will like to try the Virtual Assistant. I guess fear of the unknow. Thank you so much for your knowledge. You’re so welcome. Best of luck! I would love to make little extra money. Love these ideas! I became a marketing assistant/virtual assistant years ago and it has really paid off. There is a big need for flexible help with social media and web edits for small businesses that can’t afford $100/hr+ “professional” firms. Yes, and VA’s who work with creative businesses often understand their unique needs in a way that larger firms sometimes don’t. Wishing you lots of success! There are some ideas here that I hadn’t heard of before that sound feasible, so thanks! I’ve read a lot of articles on side hustles and most are unrealistic…This is a really unique and helpful list! Ooh, some interesting ideas on here that I haven’t seen elsewhere. Will definitely look in to some of these 🙂 Thanks! Thank you for your great ideas, all I need to do is get off my lazy behind, omg. These are some really good ideas. I’ve sold some things on offer-up but never even thought about using instagram to reach a much larger audience. I would love to work from home! Thank you for this post 🙂 Happy Holidays! I like the idea to create stock photography. That sounds like fun. Some really great ideas. Never realized that some of these were even ways to make money, like the loop promoter. Very interesting.